I think it’s probably about time I discussed some projects I have been working on the past month and a bit. These projects also happen to the part of the reason I have not been blogging for a while, or at least not as regularly as I’d like with the other reasons been having my wisdom teeth removed and various social events. In general I’d like to start working on (and documenting here) more projects, in particular projects that will help me learn new things and skills. 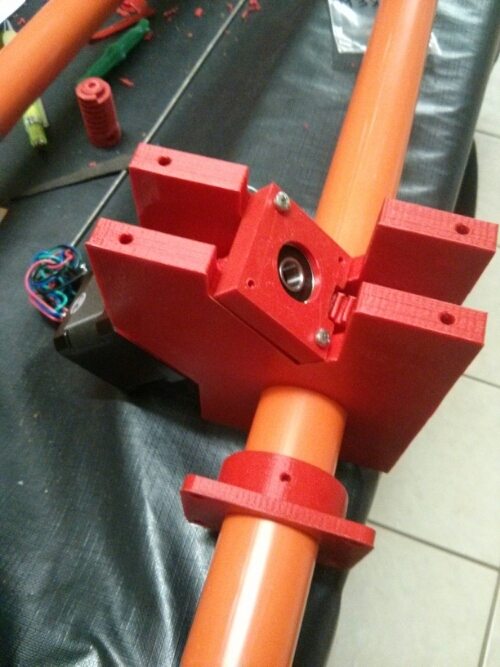 So to start off with I have been collecting and 3d printing parts to build a SatNOGS antenna rotator. While I’ll give a more in depth introduction to the SatNOGS project (designed by a hackerspace in Greece) in its own series of posts, a brief outline of what the project aims to achieve is to create an open source hardware and software platform to communicate with satellites in orbit. Below is a picture of a quick fit test of one of the gear assemblies that drives an axis. Besides this project I have one other thing I’m slowly working towards building, that is, an Automatic Dependent Surveillance Broadcast (ADS-B) receiver. As I started learning about software defined radio (SDR and yes another thing I’m yet to blog about to spite having a draft post somewhere) I came to learn about all the different radio signals that are out there that can be listened to. Turns out commercial aircraft are required to have a radio transponder which transmits their co-ordinates, trajectory, destination etc… which can be used instead of a secondary radar by air traffic control. Many people have built systems to be able to listen to this signal and I figure it’d be a fun little project to do the same so I can see the local aircraft in my region in real time. So yeah that about it, SatNOGS Build and ADS-B receiver. Most of the parts for the SatNOGS project have now been acquired or 3d printed so assembly and documentation for that will start pretty soon, maybe as soon as this weekend if I get my act into gear.